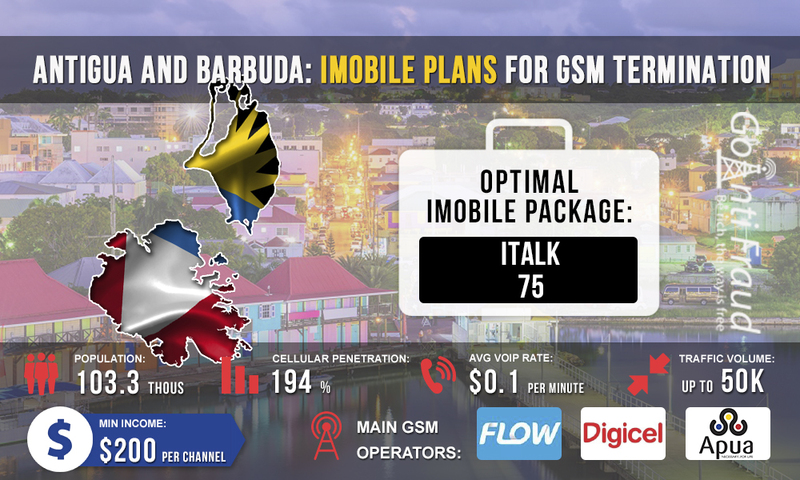 iMobile is the smallest mobile service provider in Antigua and Barbuda. It is operated by the public telecommunications company APUA. Despite a relatively small-scale subscriber base of the operator, its SIM cards are quite suitable for a profitable VoIP GSM termination, iMobile, or iNet, offers many advantageous packages for prepaid customers. $0.3 per minute - to the numbers of other operators. italk 10. Price — $1.85, duration — 1 day. Bonuses: 50 minutes for local calls. italk 75. Price — $9.2, duration — 7 days. Bonuses: 300 minutes for local calls. italk 100. Price — $12.5, duration — 7 days. Bonuses: 600 minutes for local calls. italk 250. Price — $29.2, duration — 30 days. Bonuses: 1500 minutes for local calls. italk 350. Price —$36.6, duration — 30 days. Bonuses: 2500 minutes for local calls. italk n serf 250. Price — $2.5, duration — 1 day. Bonuses: 100 minutes for local calls. italk n serf 750. Price — $11, duration — 7 days. Bonuses: 600 minutes for local calls. italk n serf 1G. Price — $914.8, duration — 7 days. Bonuses: 1200 minutes for local calls. italk n serf 3G. Price — $33.3, duration — 30 days. Bonuses: 3000 minutes for local calls. italk n serf 5G. Price — $40.7, duration — 30 days. Bonuses: 5000 minutes for local calls. For making money in the field of landing wholesale voice traffic, the italk 75 package will suit the best. With this package, the price per minute of a talk will be about $0.03. Thus, the minimum earnings of the entrepreneur will be about $350 from each port of VoIP gateway).